Ali Abbas Zafar’s ‘Gunday’ is set in a very 1970-ish mould: destitute boys, who eventually emerge as the messiah of the poor, a tale of friendship, love, betrayal and inevitable reunion. The director does inject a neat twist into this predictable plot but it is the performances that make the film more watchable. Arjun Kapoor plays the hotheaded Bala who doesn’t think before pulling the trigger. He brings a rare vulnerability to his portrayal. Even though his character is brash, uncouth and reckless, you can’t help but feel for this angst-ridden gunda. Ranveer’s Bikram, as a character is a lot more linear unlike the layered Bala. There is ample show of their well-sculpted bodies as they indulge in slow motion fistfight sequences and it is a welcome change to see that filmmakers are increasingly aware of the female gaze as well when they are selecting their male protagonists. The humorous bits where the two heroes try to woo their ladylove in turn also makes for some genuinely funny moments in the film. For a while, Priyanka’s choice for this role is a little unclear. While she manages to look hot in the ‘Asalaam e Ishqum’ song, you wonder why she keeps sauntering in and out in elegant dhakai sarees and really doesn’t contribute much to the story. Later, after her presence is explained, I still felt that she was the weakest link in the acting department. Even her clothes, especially, her low-back blouses look too contemporary to blend with the old-fashioned canvas of the rest of the film. Irrfan Khan belts out another brilliant performance. He is effective and impressive as ACP Satyajit Sarkar. As the manipulative top cop he essays a restrained portrayal and has some of the best dialogues in the film or may be it is just his delivery that makes the lines memorable. The film was touted as one that had recreated the Calcutta of the ‘80s, perhaps that explains the presence of a lot of Bengalis in the theatre. But the film neither romances nor provides a true portrait of the city. A few shots of Howrah Bridge and a sequence shot during Durga Puja hardly do justice to the city. We don’t get a feel of the City of Joy at all. There is a scene that is shot in the Metro Cinema – Metro used to be for the elite in the past, therefore the seating and the crowd looks completely incongruous to the history of the theatre. The film unsuccessfully tries to address issues of displacement by making the two young coal thieves refugees in this country. It could have been any story about the haves and have-nots, the refugee aspect is mentioned but not developed. It is simply the story of two young boys who in their struggle for survival choose to pick the dark side and get tainted for life. Wearing white clothes in one of the first scenes they remind me of Ajay Devgn in ‘Once Upon A Time In Mumbai’, since his beginning had been tainted with the colour of coal, he would always wear white. There is very little that is actually original in Ali Abbas Zafar’s ‘Gunday’. Sohail Sen’s music is immensely catchy; especially the ‘Jiya’ song sung by Arijit Singh has a haunting quality about it. 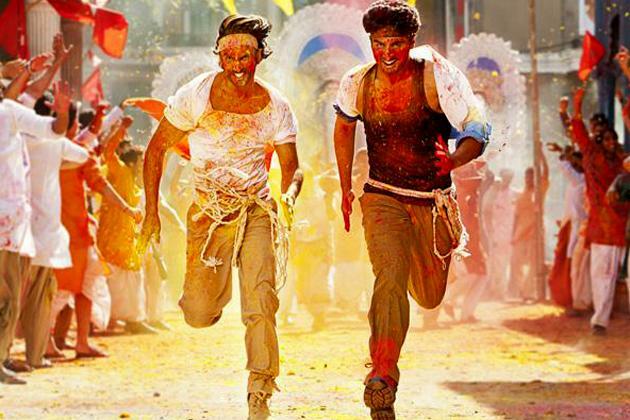 Despite its flaws, the various elements in ‘Gunday’ somehow come together and bring you a watchable film.